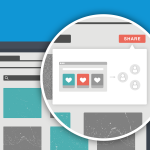 With the release of Opera 26, we enhanced our visual bookmarks with another killer feature: sharing. 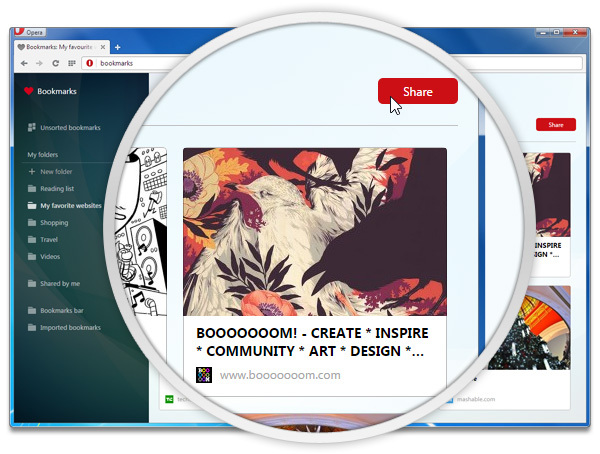 Now, you can easily share bookmarks in Opera with your friends, family and colleagues. It’s so much quicker than copying each page link separately. In this article, we’ll cover some practical details that will help you get the most out of this feature. It’s entirely up you. Once Opera generates a unique public link that you can copy and send via email or a messaging app, by posting it in a social network or even publishing it on your blog. I’ve just asked each of my colleagues in the office to come up with one example of a bookmark collection to share. Here are some of their answers: hotel options for a vacation you’re planning with friends, recipes for a big family dinner, articles your classmates might need to prepare for a test, design ideas for your new room. The possibilities are endless! No matter what browser your friends use, they’ll see your shared bookmarks as a gallery with page previews. So, they won’t need to guess where that 100-symbol URL will take them. 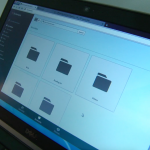 Opera users will also be able to import your collection into their bookmarks right away. 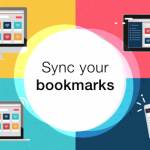 By default, the lifetime of a public link to your bookmarks is 14 days. But, you can extend it if necessary. Go to the Shared by Me folder, check a bookmark collection and click the Extend Share button. While there, you can also close the access to a shared bookmark collection. Just select a collection by clicking on the checkmark and hit Delete. What bookmark collections have you already shared with your friends and colleagues? If you’re not an Opera user yet, we suggest that you download our browser right now and give the new Opera bookmarks a try!